The easy ingredient list and preparation will make this a go-to recipe any morning of the week. Adding aroniaberries to the batter make it all the more powerful of a breakfast. Serve with butter or syrup. 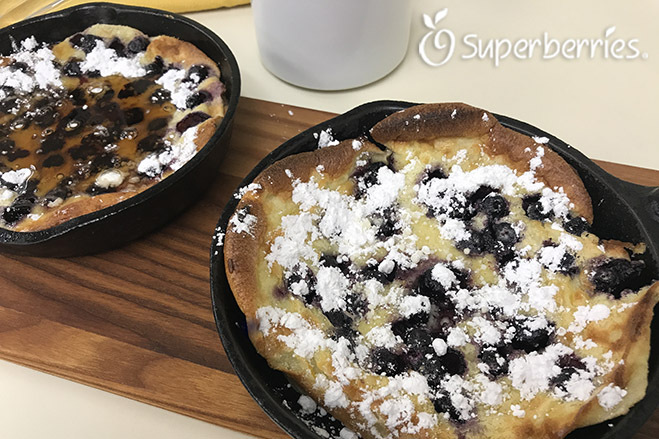 The dutch pancake is a cross between a French Crepe and American Pancake. Enjoy. Preheat oven to 400 degrees. Mix together eggs, milk, flour, sugar, lemon zest and salt. Heat four small skillets (6 1/4 inches). Divide butter among them and melt. Equally divide batter among the four pans. You can also use a 12 inch skillet. Scatter aroniaberries over the top of the batter. Bake until puffed up and cooked throughly, 15 to 18 minutes. The tops will puff up, but don't be alarmed they settle down upon cooling. Sprinkle with confectioner's sugar. Serve immediately.